Depuys Spring Creek, Paradise Valley, Livingston, Montana. Spring creeks and limestone creeks are similar in appearance, but each originates due to a unique set of geological conditions. The limestone creek’s source is typically an underground river or drainage system that emanates from within limestone deposits. 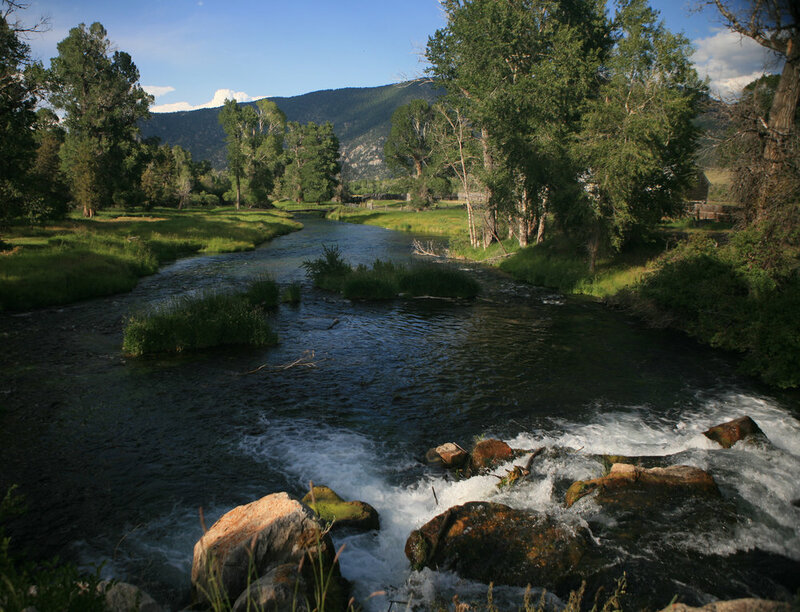 In contrast, the spring creek arises from an artesian spring or series of geologically related springs over a much wider range of geological settings. Water contained in a permeable rock layer is often trapped between two impermeable rock layers. When the permeable layer is pushed to the surface by an uplift event, it breeches the uppermost impermeable layer. A spring arises at that location due to the fact that water in the permeable layer is held there under pressure. When the pressure abates, water gushes forth, creating rivulets, or in some cases massive springs that give rise to the river. Since spring creeks do not flow over limestone deposits, their waters tend to be more acidic than limestone creeks. As the result, less calcium carbonate is available, limiting macroinvertebrate diversity and abundance. Trout density is less in the spring creek than in most limestone creeks. Spring creeks are still more productive compared to most freestone rivers, due to their gentle nature, abundant macrophytes and year-round production of stream life. Nelson's Spring Creek, Paradise Valley, Livingston, Montana. Macrophytes and trout. Limestone Stream, South England. Armstrong Spring Creek, Paradise Valley, Livingston, Montana.